Mathematics: In Grades One and Two, students are introduced to place value and the hundreds. They master the Addition Tables and get to practice addition and subtraction without carry. They are introduced to simple one operation story problems. EDUGATES Supplementary Notes and Worksheets in addition to Textbooks are used. Multiplication is introduced in Grade Two and it is mastered in Grade Three. Fractions are introduced in Grade Three and they are finished in Grade Six, then revised in Grade Seven. Decimals are introduced in Grade Four and they are finished in Grade Six and revised in Grade Seven. Grades Two to Six learn how to tackle word problems that increase in level of difficulty with classes. 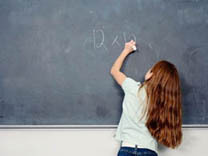 Two operations, then more sophisticated word problems are taught; those problems cover age, speed time and distance and other applications that introduce students to the usage of mathematics in real life. Students of Grades 1 to 6 are introduced to Informal Geometry and learn the basic notions of Points, Lines and Planes, and the names of the Different Geometrical Shapes, and the Basic Formulas for Area and Volume. They learn how to draw simple geometrical figures and the names of regular figures. Languages: A well-selected series of Reading, Grammar, Writing and Social Studies books is used and is supplemented by EDUGATES notes. Grade One students would by the end of their school year be able to express themselves clearly and communicate easily with native speakers using correct Language. Grade One students would be able to Construct Simple Sentences and Write them down correctly. They would be able to Read fluently and they learn to implement Grammar correctly through Usage lessons. Their Vocabulary is enhanced by direct teaching of new words and by making sure that they use those newly learnt words so that their vocabulary becomes active. Grade Two are introduced to Paragraphs and are expected to be able to construct correct paragraphs by the end of the year. Their Reading is extended to cover non-phonetic Blends and they learn further rules of Pronunciation. Their Vocabulary is extended further using the Themes tackled in their Textbooks. Simple Verb Tenses are introduced at this level. During the years of Grades Three to Six, students learn all the required skills of Reading and they become capable of reading any text given to them and discuss it orally or produce a written Summary about it. They are trained to produce Narrative and Descriptive essays and are briefly introduced to other Writing Styles. They cover all elementary Usage Rules and are capable of using them correctly. Selected English Social Studies courses introduce the primary students to The World and Its Peoples. They learn about Maps and elementary Geography and general History of the world including ancient history. Civics and Religious Studies courses follow the Omani Educational Authorities’ rules, regulations, and curricula. EDUGATES® adopts the Delta Education series for primary Science called the SCIIS3 series. This American Hands-On Science course that develops Scientific Working and Critical Thinking skills and that comes with a complete Science Kit for every class. The course has a Life Science part and a Physical Science part. Students learn that the scientific method starts with Observation, then formulating a hypothesis, then testing the hypothesis by experiment in order to verify it or reject it. The science course trains the students to think correctly and design experiments and study the results. Students learn to accept Theories only if those theories are supported by evidence and to denounce a theory whenever scientific evidence contradicts it. This course is a very useful and successful course and impressive scientific terms become part of the children’s active vocabulary. During this stage, regular classes are given in the above subjects and in PE, Music, and Art. Students are also encouraged to join clubs and teams in order to sharpen their skills and develop their talents. Primary are taught Information Technology and they become skilful at using software packages.